With only one chance to make a first impression with prospective buyers, a quick, inexpensive way to present your home in the best light is paint. 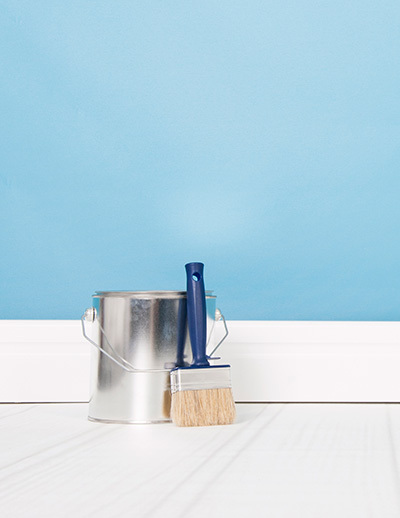 While it only costs as little as $10 a gallon, the impact of paint on buyers can be huge: a potential bump in your home value of one to two percent according to Consumer Reports. To maximize its power, start outside by sprucing up the front door with a new shade that will welcome buyers and set the tone for the rest of the home. Once inside, be sure to tackle all the rooms that may need a transformation. So in addition to revitalizing spaces that have dark or dated colors, be sure to inspect high traffic areas for scuff marks, fingerprints, and peeling or chipped paint, and address those as well with a fresh coat. The next step is to select colors. Trends change and tastes differ, so it’s best to stick with neutral options that make a home look fresh and clean, and open up small spaces. These tones also let buyers to envision themselves and their furniture in the space. But don’t limit yourself to whites or beiges. Today, lots of colors fall into the “neutral” category, including soft blues and greens, so get inspired and have some fun with a range of hues that have broad appeal. And don’t forget that paint’s versatile and can be used for surfaces other than drywall. If you have outdated tile on bathroom walls, a wood paneled family room, or dark brick exposed in your kitchen that you’d like to brighten, paint offers a cost-effective facelift. Just be sure to follow instructions for preparation and use products specifically designed to cover the surfaces to ensure proper adhesion and finish. Thinking about listing your home for sale or need some staging advice? Call me at 401.499.7541.